Did you know that Barnes & Noble sells an e-reader? If you haven’t stopped by one of their brick and mortar stores in the last few years, you might never have known. This is because the tablet in question never quite got the sales momentum that its primary rivals, the Kindle and the iPad, had automatically built in. (More on that in a moment.) And the NOOK, as Barnes & Noble has dubbed their creation, already seems to be on the way out. I stopped by a Barnes & Noble while driving through central Montana, and … gone are the enormous beautiful displays, the wide sweeps of banners and posters emblazened with larger-than-life-size images of the tablet, its logo, and cheery recommendations on what ebook to read next. It looks as though we’re back to basics when it comes to our favorite (by default, since it’s our only) big brick and mortar bookstore! But what about the NOOK? Should you as an author care about the rise and fall of this non-gargantuan piece of technology? The short answer is yes. The reasons why can never quite be summarized as a “short answer,” but I’ll do my best to stick to the important bits. 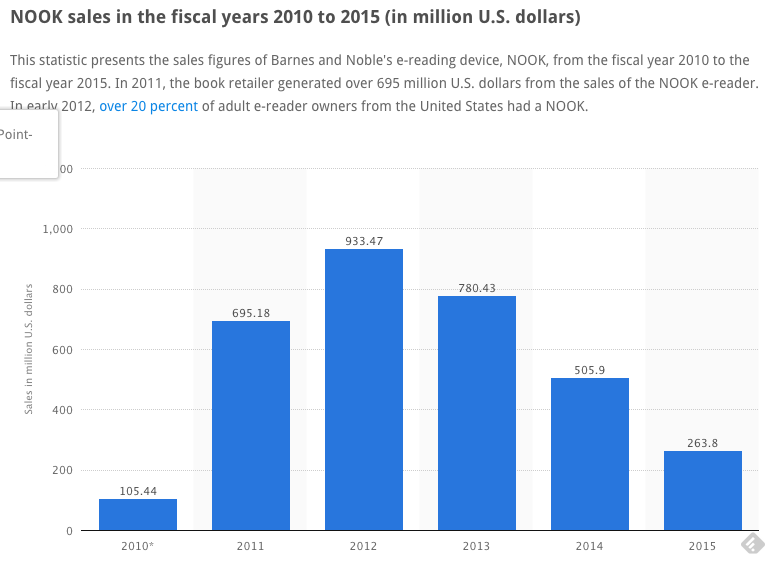 As you can see, NOOK sales are certainly, shall we say, “plunging.” But Statista still reports approximately $263.8 million dollars in sales for 2015 to date, and that’s not an insignificant percentage of the total ebook market. The real concern, for you as an indie or self-published author, is whether any of those sales translate into profits for authors outside of the traditional Big Five publishing houses. And that data simply isn’t available, though anecdotal evidence seems to indicate that the NOOK store is not the most profitable place to publish your ebook. Which is not to say that it’s not a worthwhile place … however, it’s far more likely you’ll connect with a greater number of new readers through the Amazon Kindle store or through Apple’s iTunes/iBooks interface. This is because most search engines and indexing algorithms will promote results in these two digital stores over that of Barnes & Noble, for whatever reason (and there may be several reasons, some shady and some legitimate, and some mere rumors). And although Kindle sales have fallen and tablet sales seem to have plateaued across the entire global market, Amazon and Apple have both proven innovative and flexible enough to roll with the punches, and their devices have held up better to changing market demands. Half of your job as a self-published author is to tackle matters of self-promotion and marketing with the business acumen of an entire PR department and the ruthlessness of a CEO. Is a strategy proving ineffective? On the chopping block it goes. Is one particular edition of your book not selling? Out the window, sayonara. Is a social media platform or blogging interface sucking up more of your time than seems worthwhile when balanced against outreach to new readers? It may be time to refocus. This is why it’s so vital that you know what’s going on with the NOOK before you decide whether or not you want to pay a hybrid publishing company to publish or spend hours of your own time agonizing over the creation of an ebook edition to sell on the NOOK Store. If your book is already moderately successful, you may find that it helps round out your total bundle of offerings. But if you’re just starting out and you don’t have much of a budget, you may want to stick with options that are guaranteed failsafes. Don’t despair for the NOOK. Just don’t be sucked into thinking that, just because Barnes & Noble has been around a long time (and now enjoys a certain kind of monopoly over the physical bookstore market), readers will pay back your investment in the NOOK store with any kind of enthusiasm. As the ebook and ereader markets mature, one thing is becoming increasingly clear: more iterations of the same device will not equate to more ebooks sold and read. In fact, readers are turning back in droves to the physical book … and that’s not such a bad thing, in the long run.